The ability for marketing to people inside cars is getting more sophisticated as advanced technologies make their way into the interiors of vehicles. Cars are not only becoming more connected, they’re also starting to gain in-car technology that can detect the emotional state of those in the car. 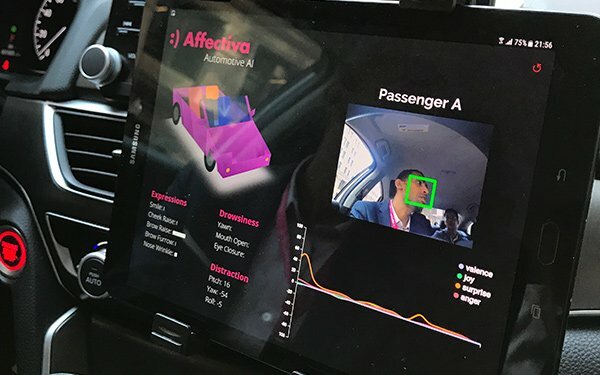 I recently attended a demo in Boston of such technology, installed inside a bright pink car outfitted with internal cameras that use facial recognition to determine the emotional and cognitive state of not only the driver but also of passengers in the back seat. The company behind the technology is Affectiva, an MIT spin-off that uses facial recognition and artificial intelligence to detect complex, nuanced emotions and cognitive states. The company has built an emotion data repository with more than 7 million faces analyzed in 87 countries. Affectiva’s technology is used by a quarter of the Fortune 500 global companies to test consumer engagement with ads, videos and TV programming, according to the company. As we sat in the car in the Boston demo, the system was set up to monitor the driver for signs of drowsiness. As the driver yawned and mimicked eye closures of a tired person, the system recognized it and sent a message to the screen suggesting the driver stop for coffee or play music. If the system detects that the diver is extremely drowsy, it recommends driving to the nearest rest stop to take a brief break or get a beverage. One camera was at the steering wheel column and another above the rea-view mirror, which monitored back-seat passengers. The back-seat passengers can be monitored to determine their emotional and cognitive states throughout a ride. The idea is that the backseat experience can be optimized, such as adjusting climate control, speaker volume or seat settings in a specific area of the car, based on the preferences of the passenger sitting there. The Affectiva name is not likely to be seen in relation to in-car sensing, since the company is marketing the system to others, such as automakers, who would incorporate it into future vehicles under their own brand name. The Affectiva demonstrator made it clear that Affectiva does not record any of the facial recognition information it notes during a drive. Others down the line using the system conceptually could use the Affectiva technology and they would have the option of what to do with the aggregate data that they gathered. 2 comments about "In-Car, Facial Recognition Senses Emotions Of Driver, Back-Seat Passengers". R MARK REASBECK from www.USAonly.US , September 12, 2018 at 10:06 p.m.
Chuck Martin from Chuck Martin replied, September 13, 2018 at 10:27 a.m.